These reminiscences about the 40th President from nearly five dozen of his friends, colleagues - even political adversaries - are poignant, humorous and fascinating. 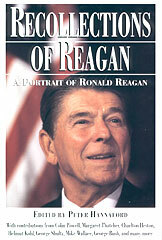 They cover four decades, from Reagan's days in film, his years as California's Governor, his 1976 bid for the Republican presidential nomination and his two terms in the White House. Included are the thoughts of such dignitaries as Colin Powell, Margaret Thatcher, Helmut Kohl, George Bush, Pete Wilson, George Shultz, Brian Mulroney, Jack Kemp, and Mike Wallace. ABOUT THE AUTHOR: The author, Peter Hannaford, has had a distinguished career in American politics and publics affairs. He was Director of Public Affairs for Ronald Reagan while he was Governor of California, and held senior speechwriting and communications positions in the 1976 and 1980 Reagan presidential campaigns. He is a senior consultant to APCO Worldwide, a public affairs'/strategic communications firm based in Washington, DC. and is the author of nine books and numerous articles, columns, and essays.